Fracture mechanics is the study of how stresses, material properties and material defects interact and lead to failure of the structure or component under consideration. This is particularly important in welds, as welds are typically the place where defects (or rather discontinuities) are most prevalent. On this page we will take a very high level look at what fracture mechanics is. It is not the intention to go into enough details to allow you to actually do the calculations. It is the intention that you understand the principles, so that when you are confronted with requirements to test the fracture toughness properties of welds and also have to apply defect acceptance criteria to welds, you understand why this is important. 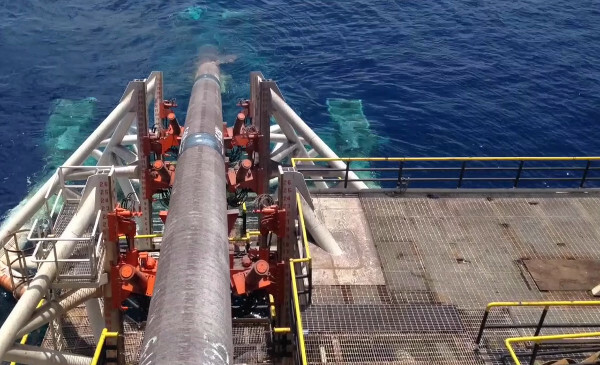 A Subsea Pipeline Leaving the Back of a Laybarge: Subsea pipelines are typically designed using fracture mechanics principles. Most people will instinctively understand that some materials are brittle, while other materials are ductile. As an example, ceramics such as those our fine china tea cups are made from, are very brittle. If we drop the tea cup it is likely to break in a brittle fashion, or if we knock the rim of the cup it is likely to “chip”. We all instinctively understand that a ceramic tea cup is “brittle”. We also know that a steel pot when dropped does not break in a brittle way. It may dent, but not break. We would describe the steel pot as being “ductile”. So, from a fundamental engineering perspective, what makes one material seem brittle and another seem ductile? To answer this question, let us think of a round steel bar (say 10mm diameter) being loaded in tension. Initially the steel bar will become longer without experiencing a permanent deformation. In other words, if we removed the load, the steel bar will go back to its original length. We call this “elastic deformation”. If we kept loading the bar even higher, then a point is reached where the bar starts to deform permanently. In other words, when we remove the loading, the steel bar will not go back to its original length. It has been permanently elongated. This permanent deformation is known as “plastic deformation”. In the case of a ceramic, if we did the same test as with the steel bar above, then we would have a small amount of elastic deformation, but it would fracture before plastic deformation sets in. In essence then, ductility is a measure of how much plastic deformation takes place before fracture occurs. When there is very little plastic deformation before fracture occurs, then we would call the material “brittle”. Some materials such as steel undergo ductile to brittle transitions when the temperature is reduced enough. 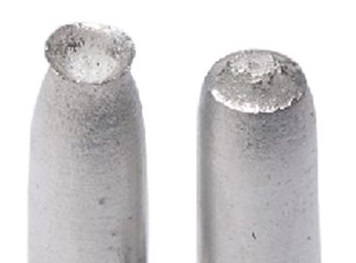 As an example, a normal structural steel will be very ductile (greater than 20% elongation before failure) at 20°C, but will break in a brittle manner (almost 0% elongation before failure) at minus 100°C. While this temperature dependency of metals’ properties is very important, please understand that this is not primarily what we will be talking about in the following discussion. Ductile Fracture: Note thinning of material and the "cup and cone" nature of the surface. Brittle Fracture: Note that there is very little deformation of the material. The fracture surface is very flat. We have seen that when a ductile material starts to elongate plastically in one direction, it contracts in the other dimensions. (Bar becomes longer, but diameter becomes smaller.) If we manage to restrain the material so that it is unable to contract in the other two directions, (we prevent the diameter from becoming smaller) then plastic deformation in the first direction becomes impossible. The material will therefore keep experiencing elastic elongation, but instead of then experiencing plastic elongation, the material will break in what appears to be a brittle manner. This type of thing happens when very thick materials are loaded in a manner that restrains the material from deforming plastically under high loads. Furthermore, when we introduce localized defects such as crack like defects, then the loading around the edges of these “sharp” defects tend to introduce local stress raisers. The material around these stress raisers will experience stresses above the yield stress, meaning that plastic deformation should result, but because of the geometry of the material and defect, the material is restrained, reducing the ability for the plastic deformation to occur. The material will then fail in what appears to be a brittle manner at some point. Fracture mechanics is the study of how materials under such circumstances tend to fail. If a material fails while absorbing a lot of energy, then the material is said to be “tough”, while a material that fails while absorbing little energy will be considered “brittle”. As welding professionals, we are concerned with providing welds that display the required level of toughness. This can be measured by tests such as the Crack Tip Opening Displacement (CTOD) test. 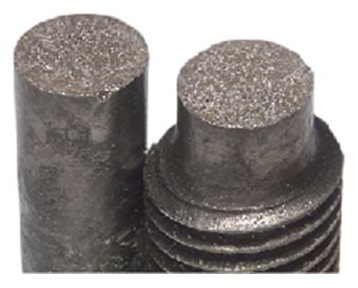 The stresses that a component is exposed to: These stresses typically include applied stresses and manufacturing induced residual stresses. The material properties of the component: These are typically the strength and toughness properties of the material. Practically the way this is used is for the equipment designers to perform calculations of the maximum stress anticipated for the equipment, and then specify the maximum defect sizes allowable (acceptance criteria for NDT) and the minimum material properties to be achieved in the welds. We, as the welding people, need to make sure that we meet the material property requirements and the defect acceptance criteria for the welds. This means that where a fracture mechanics approach has been used, the material properties are measured during the welding procedure qualification process, and the welds are monitored with the necessary NDT to make sure that the acceptance criteria are met. 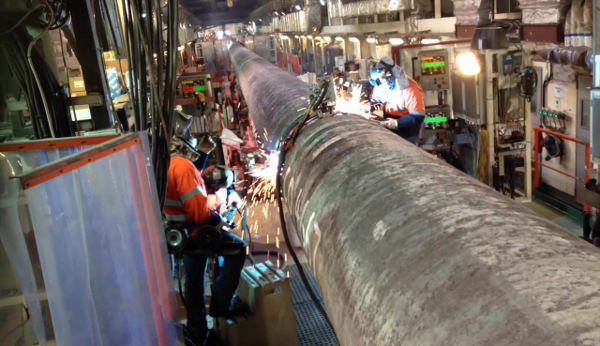 Welding on Subsea Pipeline in Laybarge: Subsea pipelines are typically designed according to fracture mechanics principles. Please note that not all components are designed using a fracture mechanics approach. Often more traditional design methodologies are used that rely on “workmanship” defect acceptance criteria. These workmanship criteria are based on historical norms of what has worked well in the past. Conventional design methods result in components that are not economical: Sometimes the more traditional design methods rely on large “factors of safety”. This means that we may end up with something like a pipeline that is very thick, making it very expensive to build. The use of fracture mechanics may enable us to build much more economical components or structures. Defects have been found that is difficult to fix: Sometimes components have developed defects during service. (e.g. A fatigue crack has developed.) When these defects are found, we need to decide if we must fix the defect, or if we can continue operating the equipment with the defect in place. Often this is termed a “fitness for service” (FFS) study. Please note that in our exploration of fracture mechanics, we did not go into any of the actual design calculations or processes. It has merely been an exercise in understanding fracture mechanics from a fundamental perspective, and its place in welding.